Mainstays solid blue streak towel is perfect for function and practicality. Made with one hundred percent cotton and finished with a simple hemming, this towel is straightforward yet absorbent. Easy to clean, just throw in the washing machine and tumble dry. 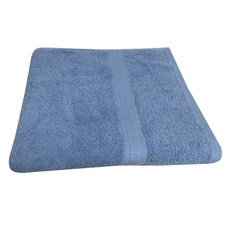 Blue streak, simple, and useful, a great towel for every day after bath or shower drying. Give your bathroom a coordinated look by using this towel to coordinate with other Mainstays bath items.